A scuba diving tungsten weight is used on the weight belt.The scuba diver must be weighted sufficiently to be negatively buoyant at the end of the dive when most of the breathing gas has been used, and needs to maintain neutral buoyancy at safety or obligatory decompression stops. 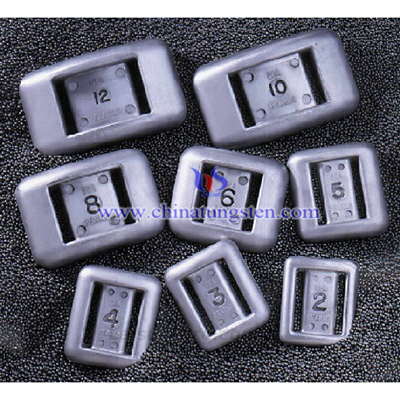 Scuba diving tungsten weight is made of tungsten alloy material, which is high density and high hardness and strength. During the dive, buoyancy is controlled by adjusting the volume of air in the Buoyancy Compensation Device (BCD) and, if worn, the dry suit, in order to achieve neutral or positive buoyancy as needed. The amount of weight required is determined by the maximum overall positive buoyancy of the fully equipped but unweighted diver anticipated during the dive, with an empty buoyancy compensator and normally inflated dry suit. This depends on the diver's mass and body composition, buoyancy of other diving gear worn (especially the diving suit), water salinity, and water temperature. The scuba diving tungsten weight can be distributed to trim the diver to suit the purpose of the dive. Surface-supplied divers may be more heavily weighted to facilitate underwater work, and may be unable to achieve neutral buoyancy, and rely on the diving stage, bell, umbilical or lifeline for returning to the surface. The primary function of scuba diving tungsten weight is as ballast, to prevent the diver from floating at times when he or she wishes to remain at depth. The most common design of weight used with a belt consists of plain, rectangular lead blocks with two slots in them threaded onto the belt. However, the lead is a toxic substance causing biological damage to wildlife and humans.once lead has been absorbed into the body, its effects cannot be corrected. As lead is toxic and unfriendly, scuba diving tungsten weight is more and more popular, as it’s high density could reach about 17.0~18.5g/cm3, and resistant to corrosion in fresh and salt water and it also environmental friendly, it will damage the human body and wildlife, and it’s could service for a long time as it’s high strength. If you have any interest in scuba diving tungsten weight, please feel free to email us: sales@chinatungsten.com sales@xiamentungsten.com or call us by: 0086 592 512 9696, 0086 592 512 9595. We are at your service.